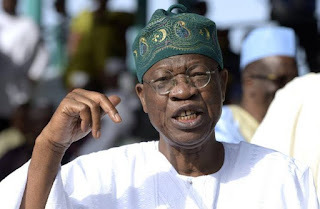 Minister of Information and Culture, Alhaji Lai Mohammed has revealed that thttps://draft.blogger.com/blogger.g?blogID=5817688018014774697#editor/target=post;postID=5110605702353781298he purported leaked audio of Minister of Transportation, Rotimi Amaechi, criticising President Muhammadu Buhari, will not break the ranks of the ruling All Progressives Congress, APC. Igbere TV gathered that the minister stated this at a media briefing on Tuesday in Abuja, said the leaked audio was part of the “mudslinging’’ politics of the opposition”. “Again, the opposition is determined to ensure that the ongoing campaign for the 2019 elections is not based on issues but on mudslinging. “What is the point in shopping around for audio clips or publications that are then maliciously edited out of context? “Why do they think this will break our ranks in the ruling party? “What advantage do they think they can get from this infantile act? “Whoever wants to circulate any audio or video clip should do so in its entirety so that the people can understand the context. “Otherwise, let them continue wasting their time circulating an audio that is clearly designed to blackmail’’.